Alfred Courmes was born in Bormes-les-Mimosas, France, in 1896. He was the son of a naval officer. Courmes was educated in Monaco. Following World War I, Courmes studies with Roger de La Fresnaye. (It is believed that he was La Fresnaye’s only student.) From 1920 to 1925 Courmes lived in Lavandou in the Provence region of France. In 1922 he exhibited at the Société Lyonaise des Beaux-Arts. Three years later he traveled to Paris to exhibit at the Salon d’Automne, Salon des Tuileries, and the Salon des Indépendants. In 1926 he painted a now famous portrait of Peggy Guggenheim. In 1927 Courmes moved to Ostende, Belgium. There he befriended James Ensor, Felix Labisse, and the well-known Belgian artist Constant Permeke. These friendships and regular visits to museums in Brussels and Amsterdam where he saw Classical as well as Surrealist and Belgian Expressionist works influenced the development of Courmes style over the subsequent decades. In 1927 Courmes exhibited his first one-man show at the Galerie Montparnasse. In 1930 he finally moved to Paris. 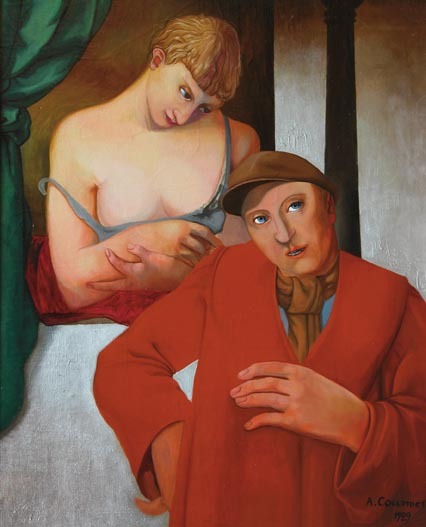 In 1935 he exhibited at the prestigious Galerie Bernheim. In 1936 he won the Prix Guillaume. Courmes was commissioned to create the decorations for the pavilion of Manufacture de Sévres for the 1937 l’Exposition Internationale de Paris. That same year he exhibited at Galerie des Beaux-Arts, Paris. In 1938 Courmes was commissioned to paint a large-scale mural for the dining room at the French Embassy in Ottawa, Canada. It measured thirty meters long and four meters high. The composition consisted of two hundred and twenty five people. After the liberation of France, Courmes exhibited with the Surrealists at the Salon d’Automne; he also exhibited at the Salon des Indépendants. In 1946 he exhibited at l’Exposition Surréaliste de Mai with Clovis Trouille and René Magritte. Courmes continued to exhibit regularly, He showed at the Salon de Mai in 1957, and the Biennale de San Paulo, Brazil in 1965. In 1971 he had an exhibition in Bordeaux, it was titled Les Autres.” In 1972 he participated in an exhibition at the Grand Palais, in Paris, and in 1977 he had a solo exhibition at Galerie Jean Briance in Paris. Between 1982 and 1989 Courmes had solo exhibitions at the Musée de Grenoble, Galerie Jean Briance, FIAC, Galerie Berggruen, Musée de Roubaix, and the Centre Beaugourg. In 1973 Jean-Marc Campagne published a beautifully illustrated monograph on Courmes’ life and work. Courmes continued to exhibit well into the 1980’s. Courmes was awarded the Chevalier de la Légion d’Honneur in 1991. His creativity and imagination never diminished. In recent years the full extent of his contribution to the art of the 20th century is being realized. In 1997 his work was included in an exhibition at the Centre Georges Pompidou, in Paris, called “Made in France 1947-1997, 50 Ans de Creation.” en France. In 2003 the Musée Arts et Histoire in his hometown of Bormes-les-Mimosas exhibited “Alfred Courmes et Son Pays.” The exhibition will travel to Belgium and is complemented by a large color catalogue. Early in 2004 a new, heavily illustrated book will be published on Courmes’ life’s work. His work is included in many Paris museum collections, including the Musée Carnavalet as well as the Musée des Années Trente; the museums used a Courmes’ painting to illustrate its first book. Additionally, his work is represented in the Musée National d’Art Moderne, and the Musée National de la Cooperation Franco-Américaine holds his famous portrait of Peggy Guggenheim. He is also represented in museums in Grenoble, Poitiers, Roubaix, Issoudun, and Algiers.